Shao Mingqing was a jobless young man from Shandong province with only a junior high school diploma when his luck turned around a few months ago with the skyrocketing price of garlic. 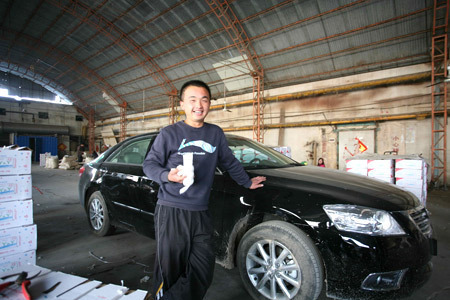 The 22-year-old Shao now drives an 180,000-yuan Toyota he bought with the money he made on the garlic market. Shao's face was lit up with joy when he talked about his recent success. "I borrowed some money and decided to buy 100 tons of garlic at the price of 3.2 yuan per kilogram (kg) in September," Shao said. "I made a profit of 400,000 yuan from selling it at the price of 7.2 yuan a month later." Shao isn't the only one who has made a tidy fortune out of garlic, which has exceeded gold and stocks as the country's best performing asset this year. Garlic trading has created a handful of new millionaires overnight in Jinxiang county, Shandong province, China's largest garlic producing area. "What we made was just some petty profits. There are people who made hundreds of millions of yuan from it," said Han Yunzhe, a garlic trader who bought a 300 sq m house with his earnings from garlic trading. Garlic prices in Jinxiang county have skyrocketed more than 50 times since last October, when the wholesale market price hit a low of 0.15 yuan per kg. 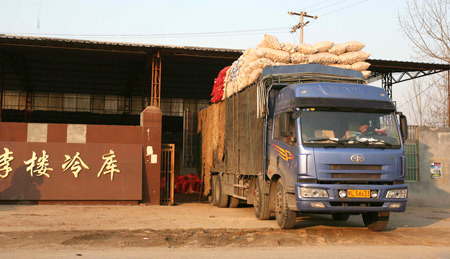 Now garlic is traded for more than 8 yuan per kg on the market. The soaring garlic prices are creating a frenzied mood among market speculators as they seek new opportunities to buy and store as much garlic as possible, betting the price will surge to a new high in coming days. Rich coal mine bosses, according to some media reports, have also joined the garlic market, hoping to reap huge profits. Some real estate speculators, who have earned big money in China's overheated property market, also are gambling on garlic, according to media reports. Experts said one trigger of the sharp rise in garlic prices might stem from the idea that garlic can help prevent infection by the H1N1 virus, although there is no scientific evidence to support the idea. But the root factor is the extremely low price of garlic last year, which resulted in a sharp reduction in garlic production, others said. Garlic farmers in Shandong province retreated from garlic planting as the selling price of garlic dropped to 0.08 yuan per kg last year. "The reduction in garlic production plus public panic over the H1N1 flu have caused garlic prices to shoot up," said Nie Binghua, director of the Shandong Economic Management Institute. But Nie noted that the high price is unlikely to affect the overall economy, because garlic is not a crop that will affect food security. Production of garlic in Shandong province dropped by 40 percent this year. And in 2008, the country reduced total garlic planting areas by 50 percent, giving speculators a reason to believe that there might be a sharp shortage of garlic in the near future.